Singing Superstar analyzes your voice pitch compared to the original. The more notes you hit the higher score you get. Get ranked after each song depending on how you performed. The inbuilt editor lets you convert standard music CD's and MP's into karaoke songs. With our partnership all Singing-Superstar.com members can purchase and download 100% legal music from all your favorite artists for as little as $0.09 per song, or around $1.00 per album. With Over 100,000 different artists, more than 2,000,000 songs, and almost 200,000 albums available you will always be able to find that perfect song. If after all this your favorite artists is still not there you can simply request it. 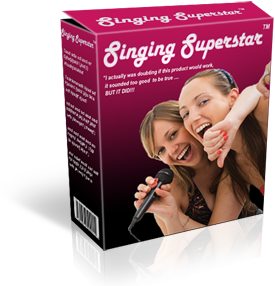 Using the latest in technology, Singing Superstar lets you store all your music in the one place, on your PC. Now there is no need to store 100's of bulky CD's. Have a laugh with you friends. Party mode offers you various game types.